With the release of XJDeveloper 3.8 the former DFT Analysis screen has been renamed to Test Coverage and merged with the Functional Test screen. The Functional Tests page is now accessed through the new Functional Tests tab at the top of the screen. The chart view has also moved to a separate tab, but all tabs can be rearranged and docked to suit the users preference. Other noticeable changes include the addition of a net access column to the Summary Statistics page and the reorganisation of the options section, along with the addition of a few new features. The calculation of test coverage, particularly around logic blocks, has received an overhaul, so some statistics may differ from those reported in earlier versions. Functional coverage propagation has also received changes, which will be covered in more detail in a later blog post. Previously the reported test coverage would reflect the total coverage from Connection Test, functional testing and any cover assigned to busses in Test Device files. A key enhancement provides a new way of filtering this coverage, which is enabled by checking the Only display coverage from enabled tests box in the Coverage Options section. With this enabled the test coverage reflects only the coverage provided by all tests enabled in the XJRunner Tests list on the XJRunner Setup screen, irrespective of any conditions in the list. This option is enabled by default for any new projects created in XJDeveloper 3.8. This provides a simple solution for investigating the contribution of individual tests or tests groups to the total coverage of the circuit, and giving a clearer indication of the total coverage as you build up the test list. If external hardware is present then the displayed coverage will also include only the hardware enabled in the external hardware settings tab. 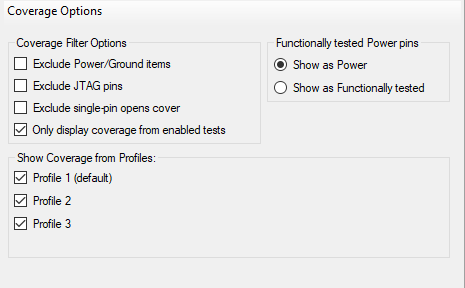 For Connection Test the coverage reflects the Enable Logic Testing and Enable 1149.6 Testing options in the Connection Test settings tab, as well as the logic-specific options for external hardware. For projects with dynamic chains this new feature allows for filtering of test coverage by profile. The coverage is calculated based on the chains in the profiles assigned to each test. In the Coverage Options section any profiles in the project are listed, with a corresponding selection box, underneath the Coverage Filter Options. With the new feature enabled these selection boxes are enabled and the test coverage is filtered based upon the selected profiles.